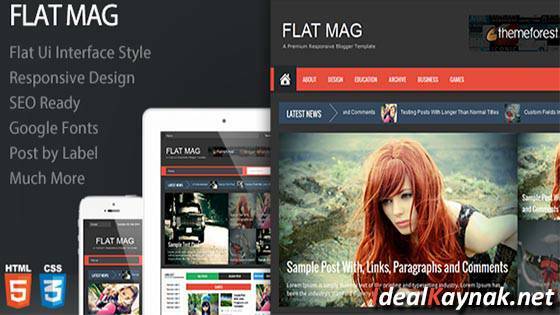 Flat Mag Blogger Template is a simple clean designed with a fresh flat style and with a great responsive design. This theme perfect for magazine or personal websites. Flat Mag Blogger Template is a simple and clean mag styled web design that comes with a fresh flat style having a great responsive design that support many electronic devices including mobile phones and computer PCs etc. This web theme is undoubtedly perfect for magazine, News or for Personal websites. It has great looking structure that is fully user friendly, moreover it is advanced Optimized for search engine optimization on SERPs (Search Engine Result Pages). It has Post by Label option, Flat UI Interface Style, Google Fonts and much more other great features have been added in this latest pack. Blogger Tema Yükleme, Blogger Özel Tema Nasıl Yüklenir?